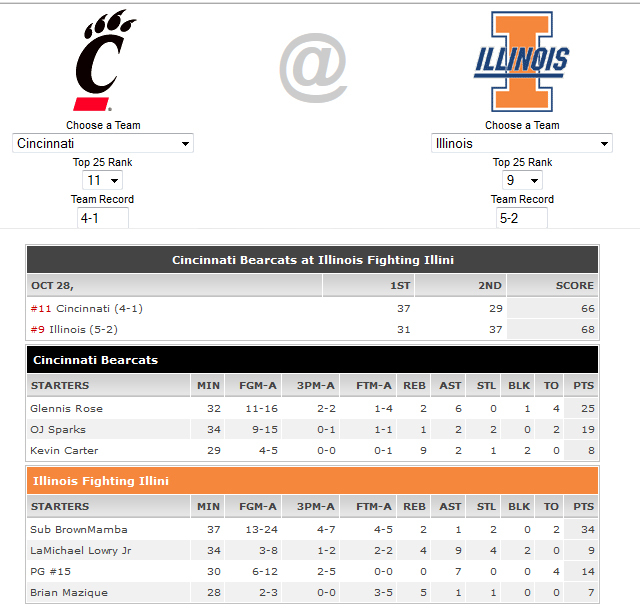 The Fighting Illini (4-2) have fallen to #11 ranking after beginning the season at #5 but are expected to turn up the heat as they face #9 Cincinatti (4-0). the talents of 2 of the nations streakiest outside shooters in Sub BrownMamba and Freshman Lamichael Lowry Jr.
Last edited by Tha2KProphet on Thu May 28, 2015 10:36 pm, edited 1 time in total. Illinois was seeking it's first win against a top 25 ranked opponent. Leading the way, OJ Sparks looked poised throughout the half. Showing no signs of distress. The early advantage could be credited to the big men on Cincy hitting the boards. Cincinatti from running away with the game. To begin the 2nd half both teams came out trading blows. ended up being a 22-10 run. Illini were now up by 8.
could stop their run, but would could continue to fight on. The Cincinatti team has 3 main guys OJ Sparks from youtube, Kevin Carter of course, and Glennis Rose from the HS mod. Also I think they have Kevin Chambers at PF. I played with these guys and this team is really good. I really enjoyed the game against Illinois. I will post the ending to their game later as I have to be off to work. Enjoy. You Gonna Put The Roster Out?? 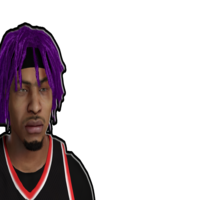 2KShiftLeader wrote: You Gonna Put The Roster Out?? I don't have any plans on releasing the full roster, with all the files included it would be a smaller version of UBR in terms of size. It's just way too many files to package together. I can release the files needed to play specific games that would be much easier. 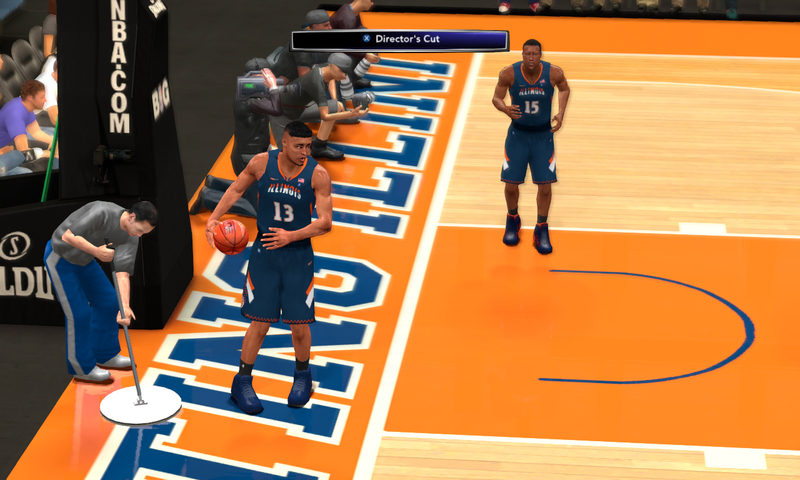 Right now I'm just enjoying the roster and coming up with stories since the roster has too many teams to run an association or season without crashing, and isn't compatible with My Carreer due to all the player slots filled. Ok Ok Thanks For Replying. The game was racing towards a victor as time slipped away from both teams. Brown Mamba would continue scoring with a man in his face. It had become the story of the game, Brownmamba would not be quieted as he continued to elevate a team that really needed a signature win to remain ranked. OJ sparks would get some rest with 2 minutes left and re-enter the game with the less than a minute to play. 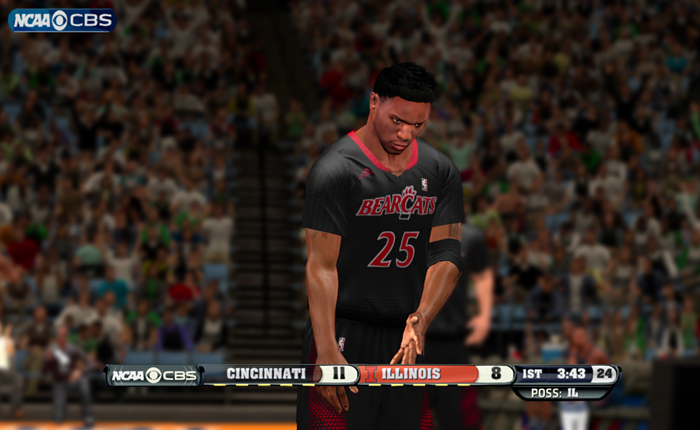 He immediately scored on an inbound catch a shoot that put Cincy back up 1. 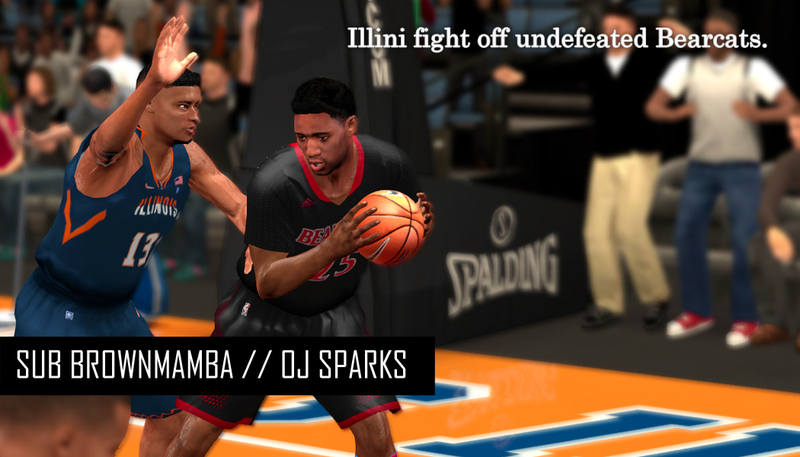 Sparks would be out done as Brownmamba once again drained a 15 footer in the face of Sparks. Glennis rose dunk on a broken play. 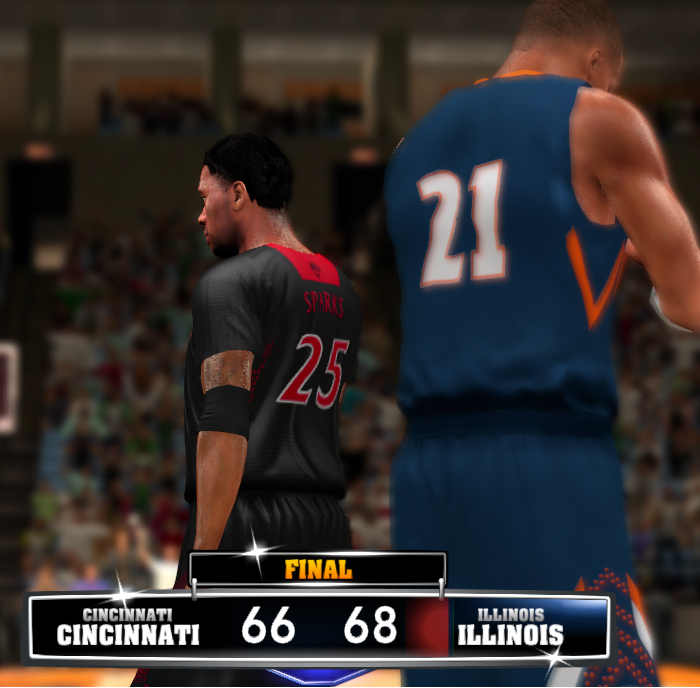 The Fighting Illini were able to secure a much needed win. This win will not shake up the national rankings but it will secure their current spot as they have defeated a quality team. Cincinatti should left the game with no doubts or hanging heads. If any there even .2 seconds more on the clock this game would have gone into overtime. The coaching staff now have film to disect as they try to figure out what aspects of play caused them to relinquish the lead. Freshman Glennis Rose still needs to work on decision making and sure up ball bandling but boy is he athletic. Scouts should be salivating. This is the first time we have seen this kid break out for a 20+ point perfomance but the nation will be watching closely to see if this was a fluke game or the real deal. Junior, O.J. 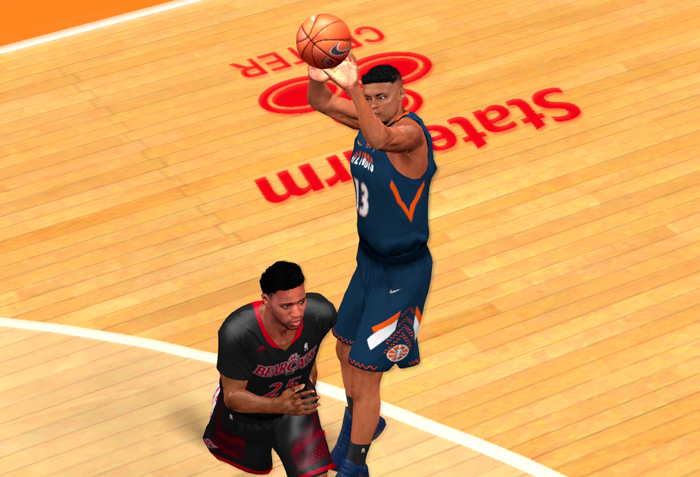 Sparks was projected as a late 1st round/ early 2nd round pick had he entered the draft after his sophomore season. This year he is showing improvement in consistency and ability to lead by example. Sub BrownMamba looked simply amazing. This kid put the team on his back and scored 50% of the teams points, leading them to a victory. He was clutch this game. The nail biting daggers are becoming his calling card. 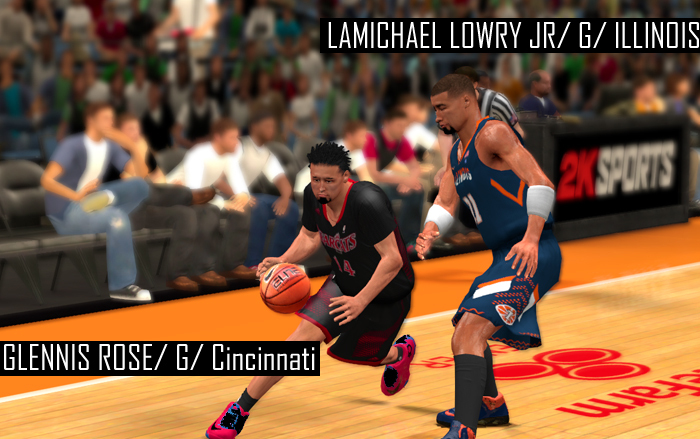 LaMichael Lowry Jr, quietly lead this team on the defensive end. This guy is very young but showed great poise and basketball IQ. This is a streaky scorer who can do it all. When he his scoring is falling short he just turns up the heat in every other category. You can credit this guy with locking up Cincy on a few possessions, which allowed BrownMamba to take over on the offensive end. Last night I began working on the fictional draft class for this story. So at the end of this college season in my story I will release it. Any feedback from readers is much appreciated. As you guys can tell I haven't been able to continue this story lately. I am having a hard time finding direction and focus for this story. All of the previous games were played in Play Now mode beacuse this roster is not compatible with Association due to the # of teams (100+). Since I have to use Play now I have to keep track of story lines, stats, conference standings, and rankings on my own or just make them up. ... I have been searching for a college hoops game on xbox 360 or ps2 online to create this roster in a dynasty type mode but I have been unsuccessful in finding the game locally. For now I will have to discontinue the story until I find a better way to construct it. Thanks to all those who did follow the story. Welp, it was fun while it lasted. TGsoGood wrote: As you guys can tell I haven't been able to continue this story lately. I am having a hard time finding direction and focus for this story. All of the previous games were played in Play Now mode beacuse this roster is not compatible with Association due to the # of teams (100+). Since I have to use Play now I have to keep track of story lines, stats, conference standings, and rankings on my own or just make them up. ... I have been searching for a college hoops game on xbox 360 or ps2 online to create this roster in a dynasty type mode but I have been unsuccessful in finding the game locally. 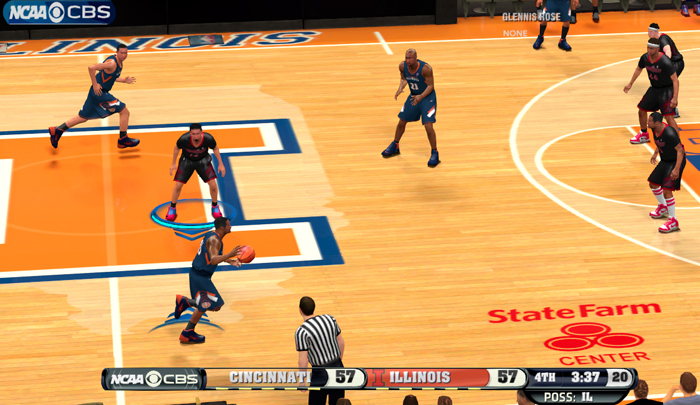 I picked up College Hoops 2K8. I will try to recreate this roster and start an open Legacy. That should make it easier to keep track of stats and rankings. I will still continue to post the screen shots from the 2K14 version. I doubt I will have any video. I will try to begin the continuation of the story again this weekend. The season underway, the excitement of college basketball was in full effect. With all of the buzz this years crop of athletes were generating, you could hear rumblings of future compensation for athletes. a full college workload to earn a degree. This also allows NCAA to continue to profit off of athletes that turn pro early or do not finish a degree. There is often a gap between the cost of attendance and the scholarship value, as illustrated below. It is a step in the right direction, many athletes believe, but it does not account for those who may stop participating in sport to simply focus on school. Also it is not clear at this time if walk-ons/ non- scholarship athletes would be fully reimbursed the full price of tuition. There looks to be a small ray of light shining in the case for compensating student athletes. If this is executed correctly this could help push collegiate sports to Another Level. Last edited by TGsoGood on Fri Feb 12, 2016 6:04 am, edited 1 time in total. Two Senior Forwards to watch this year are Tory Norville and Sniper Jones. 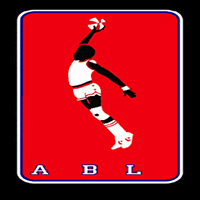 Both lit up the AAU and ABL summer leauges this past season. Both are ranked as 5 star prospects going into their senior year and they are still deciding what schools they would like to attend. Both could be looking to attend school in the South/ Southwest regions as Texas university appears to like both but they are currently undecided as the early signing period approaches. Tory Norville also list Butler university as his #2 school, meanwhile Sniper Jones is keeping his rank of school's quiet at this time. Jackson Ellis beginning his Final Collegiate season with surprising play. After posting a 0 point 4 rebound game last week due to minor injury, he rebounds and post a 24 point 13 rebound game @ home against Baylor. Now that we have seen a few game's to begin the season let us begin to focus in. Butler is a team many expect progress as they have brought back many contributor's from last year's team that made the tournament. Lead in scoring by the Sophomore who erupted on to the scene in last year's tourney, this team is expected to navigate through the regular season and try their hand at the post season once again. The team is coming off an excellent victories over Cleveland State and Buffalo. Cleveland State's gaurd Angelo Wallace can light it up whenever he likes. Butler was able to hold him to just 14 by putting forward's Van Arnold and TGsoGood on him all night. This allowed Kevin Parker to roam on defense and stay energized on the offensive end. Buffalo held their own for 4 quarters but were not able to maintain, losing gas in the OT period to take a tough L.
The freshman had a great performance to help Butler overcome a scrappy Buffalo team. 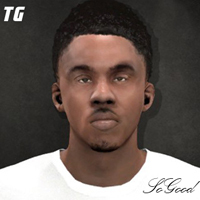 TG SoGood scored all 8 points in the 2nd half and also had 3 steals and 1 block. To top it all off he was a great 2nd option that helped the team's #1 option Kevin Parker get going on the offensive end, showed great versatility and poise! Aaron Phillips of Kansas sticks it to Arizona for the early lead.